How do I know if I require a VA? If you personally are having to undertake these tasks which in turn means you are not able to devote your time to managing and growing your business then a VA is the perfect solution, both cost effective as well as highly experienced you can pass these tasks on and know they will be completed efficiently, cost effectively and most of all professionally. What costs do I incur using a VA? As your VA will be self employed the only costs you will be invoiced for are the actual hours worked or by tasks completed. You can then in turn budget for the number of hours you will need and can afford. How do I communicate with my VA if they are not based in my office? Your VA will work with you to evaluate the best way for you to communicate your work assignments, this can be dependent on how your day/week is structured and whether you are mainly office based or work remotely. Communication can be in the form of e-mail, telephone, fax, post, audio transcription or by a web based tool such as instant messenger. How do you monitor your Services Levels? 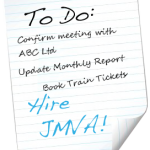 At JMVA we monitor satisfaction by holding regular reviews with our clients. Review periods are dependent on the length of the clients contract and how long JMVA and the client have been associated with each other. Reviews would normally take place quarterly, but where a client is new to JMVA or is only looking for short term support reviews would be held more frequently as agreed with the client. Can I validate your credentials? JMVA is accredited with having undergone training with VACT (Virtual Assistant Coaching and Training). VACT has a network of key people that can be called upon by JMVA for support if required. JMVA is also a member of the UKAVA (UK Association of Virtual Assistants). Please also refer to our profile page which has testimonials from our clients. Verbal references can be obtained if required. Yes, JMVA is covered for Professional Indemnity Insurance. Sign up to our monthly newsletter and keep up to date with helpful tips. When I first founded JMVA in 2008 the role of the Virtual Assistant was very new to the UK.